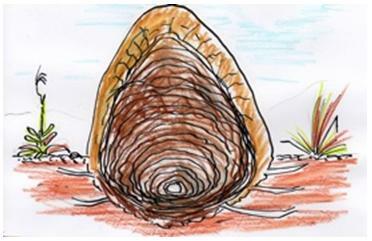 Termites that build mounds are subterranean but not included in the termites that do 99% of the damage to homes. This is because mounds are very visible, not tolerated around buildings and, it is very easy to kill these colonies by physically destroying the mound. If you are on an acreage property, make it your rule not to allow any mounds to develop within 200 metres of a building or other structure. Use a crowbar, a pick/mattock to break open the top/sides. The outer ‘mud’ is often very hard. (Years ago, mounds were used for building homestead tennis courts). The less dense and crumbly interior is easier to break. The queen and the nursery are at the base of the mound and if you can’t physically get down there, use 30-40 litres of the dilute insecticidal mixture as above. If you don’t finish off the queen, the colony will be re-built in weeks and you’ll have to try again.